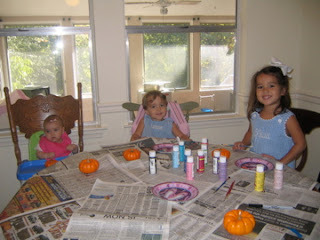 Ole Miss Mom: Painting Pumpkins! It's pumpkin time around here! Or, "Hallowink" as my kids call it! Little does Olivia know that her school doesn't participate whatsoever in Halloween and we only go to a fall festival the church puts on. But that's OK with me! :-) I'm not sure if I'm ready to troll the hills of our neighborhood trick or treating yet! I saw these baby pumpkins at Walmart the other day. 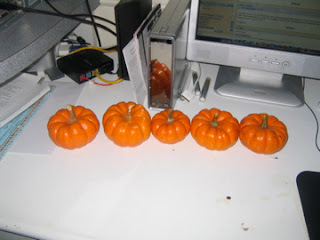 I got a bag with 5 little pumpkins graduated in size...see where I'm going with this. :-) We painted Daddy, Mommy, Olivia, Landon, and Lillian a pumpkin!! It was so much fun. I even put Lillian at the table to watch what was going on. She seemed a little stressed after a few minutes though. 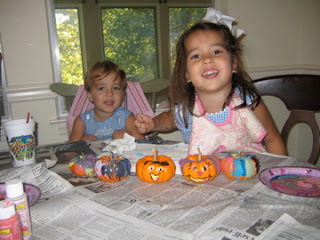 I painted faces on the mommy and daddy pumpkins. The kids just went to town on theirs! But hey, it kept them occupied for 30 minutes of the day....right!? In the video I tell Landon not to drink the paint water. It looked like he was going to - and I wouldn't put it past him. Crazy boy! Don't you hate your voice when you hear it! Oh well, I know that's exactly what I sound like to you guys! Can You Spot the REAL Baby? ?